The Architect of the Capitol's (AOC) Capitol Building jurisdiction preserves and maintains the U.S. Capitol with the help of its many shops such as the Carpentry, Electrical, Masonry, Paint and Plumbing divisions. At a critical time in the building's evolution, there was also a Capitol Bronze Shop. From 1855 to 1859, the shop helped serve the needs of the Capitol Extension, a major expansion project of the U.S. Capitol to accommodate a growing Congress. Captain Montgomery C. Meigs, supervising engineer in charge of building the Capitol Extension and later the new Capitol Dome, established the Capitol Bronze Shop to cast ornamentation and small works of art for the extension. A graduate of West Point trained in engineering, Meigs also studied art and saw the expansion project as an opportunity for "the advancement of art in this country." So intent was Meigs to elevate the artistic expression of a rising nation that he became the extension's chief decorator as well and convinced Congress to give him a generous budget for art works. 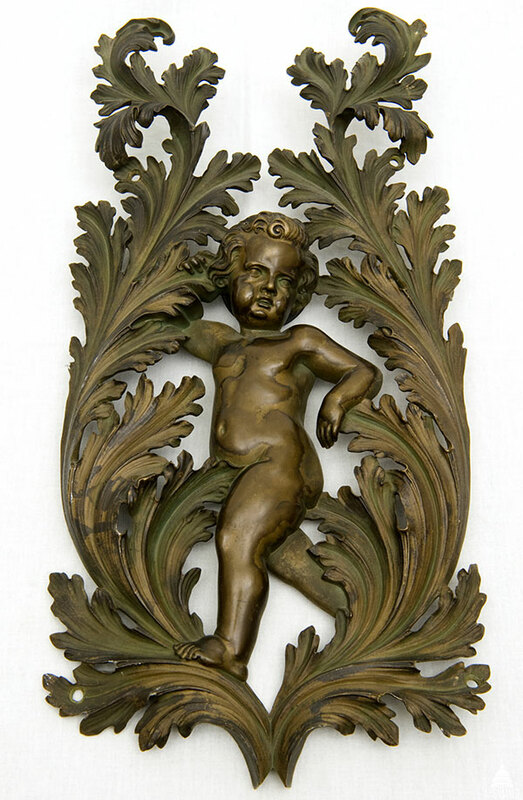 Bronze decorative element from the gallery doors of the 1857 to 1949 House Chamber designed by Constantino Brumidi. By the mid-nineteenth century, the Industrial Revolution helped revitalize the use of bronze for sculpture by allowing works to be cast in editions. However, only a few bronze foundries existed in America in the 1850s, prompting Meigs to set up the Capitol Bronze Shop as a foundry of his own, the only one operated by the government at the time. Also known as the Bronze Works, the shop was located just northeast of the U.S. Capitol near other shops established for the extension. Meigs hired Frederico Casali to be the Capitol Bronze Shop's first foreman. Casali was an Italian modeler and founder and friend of Constantino Brumidi, who was also hired by Meigs to paint the now-famous murals and frescoes of the U.S. Capitol's Brumidi Corridors and Rotunda. Additional workers hired for the Capitol Bronze Shop included founders, chasers, bronze filers, finishers and laborers. They initially cast ornamentation and small works of art and later produced more practical fixtures such as hat hooks, hinges, heat registers and keys. Bronze door handle to the chamber of the House of Representatives in the shape of a snake. Also seen close up in cover photo at top of page. 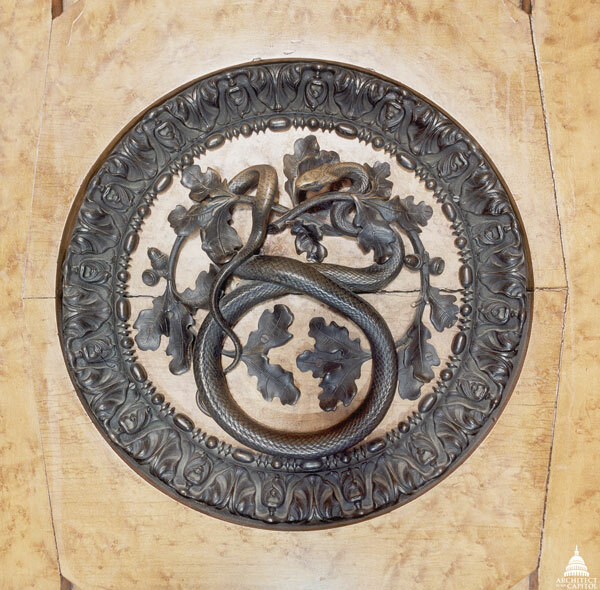 Casali's ornamentation works included intricate snake door handles that can still be admired on a pair of doors in the east entrance to the House Chamber. Here too, Meigs' influence loomed large, as a proponent of art inspired by nature. While visiting other engineering work sites he was responsible for, the ever industrious Meigs caught several black snakes and copperheads and brought them back to Casali, who took molds directly from the bodies of the snakes to cast them in bronze. Meigs also encouraged Casali to work with flowers and leaves found on the U.S. Capitol Grounds to create finely detailed and accurate depictions that also adorned the doors. Castings of rosettes, eagles, acanthus leaves and grape vines were made to embellish the doors' valves and frames. Having studied the latest in bronze casting techniques, Meigs even advised Casali on what types of bronze alloy and patina to use. Before the doors were completed, Casali died of a sudden illness in July 1857. Meigs acted quickly to hire a new foreman. His name was Joseph Lassalle, a Frenchman who had lobbied Meigs ardently for the job even though Lassalle had joined the Capitol Bronze Shop only months before. 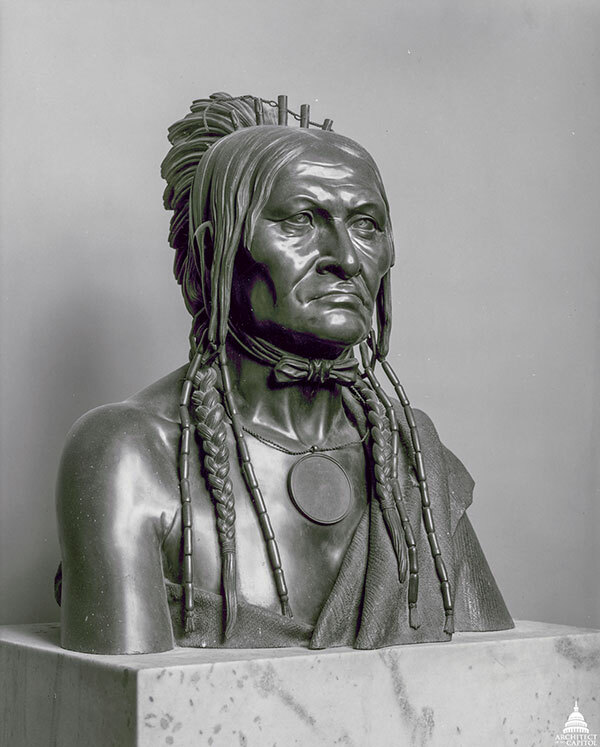 Bust of Chief Be sheekee by Joseph Lassalle in the U.S. Capitol House wing. Nevertheless, the shop's work under Lassalle was notable and included casting a bust of the Ojibwa (Chippewa) Chief Be sheekee, which is still exhibited in the House wing and is based on the marble bust by Francis Vincenti. Ornamentation for the gallery doors of the new Senate Chamber, identical to those of the House Chamber, were also largely completed. By 1859, however, events coalesced to shutter the Capitol Bronze Shop. In the previous months, allegations had circulated that Lassalle had mistreated his workers. Then Meigs, a principled but contentious leader himself, was replaced by Captain William B. Franklin to finish the Capitol Extension. At that point, the project was near completion, so one week after his arrival, Franklin informed Lassalle of the shop's imminent closure. Any remaining bronze casting would be done by a commercial firm at a lower cost. For a brief shining time, the Capitol Bronze Shop produced ornamental works and small sculptures following the highest standards of casting, and some of its work continues to adorn the U.S. Capitol to this day. The shop's legacy also reflects the leadership and foresight of Montgomery C. Meigs, one of his generation's greatest innovators and patriots, who later served as Quartermaster General of the U.S. Army during the Civil War and was credited with helping to secure the Union victory. This blog utilizes the expertise of AOC's Senior Museum Curator Jennifer Blancato and her previously published works on this subject. Thanks for this informative article. Great to hear of the unsung artists and crafts workers. Interesting piece of history of the U.S. Capitol. Thanks for the great research. Well written, interesting and fascinating article Thanks for helping to keep the Capitol's history, and stories, alive!